PERFECT MULTIFUNTIONAL PRECISION TWEEZER SET YOU DESERVE IS OVER HERE! Curved Tips Tweezers: Used for high precision operation and extraction in narrow space. Flat Head Tips Tweezers: Used for clamping bigger components. Pointy Tips Tweezers: Used for grabbing tiny components for precise work. Acne Tweezers: Used for picking up pimples or to scraping off blackhead or whitehead. Comes with a zippered storage bag to keep your tools in perfect order and protect your tools from being scratched at all the time. A detailed user manual is included in the package to introduce the specific function of every pair of tweezers. Every product provides a 45-day money back guarantee & 18-month warranty. 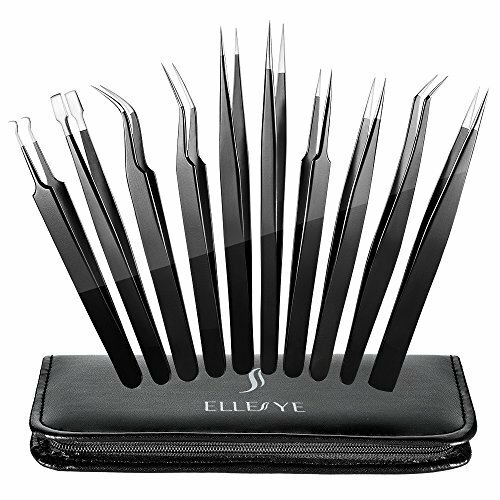 【10 Pairs ESD PRECISION TWEEZERS SET】10 pairs of anti static precision tweezer set, including 1 pair of flat head tweezer, 1 pair of powerful curved tweezer, 3 pairs of curved tips tweezers and 5 pairs of pointy tips tweezers for different purposes.You can use these craft tweezers for craft, jewelry-making, electronics, laboratory work, etc. 【WIDE APPLICATION】This precision tweezer set particularly suitable for craft，electronics, jewelry, and laboratory work. Every product provides a 45-day money back guarantee & 18-month warranty.Contact us if you have any question.